The Tibetan Mastiff, an intelligent and reserved breed, originates from Tibet and is considered one of the most ancient breeds worldwide. 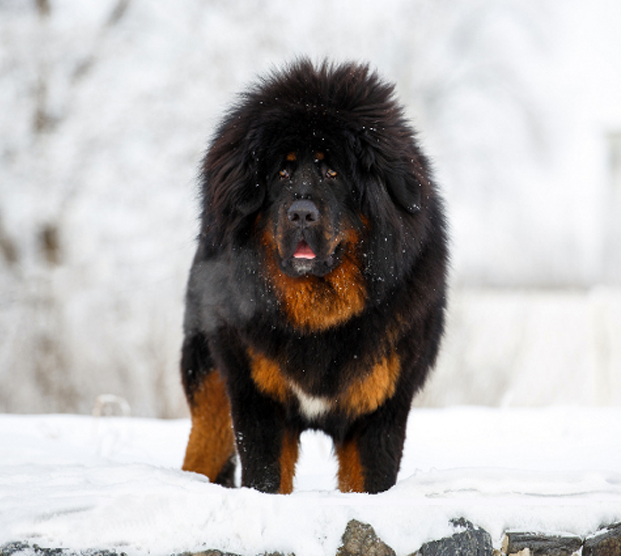 There are cave drawings from the Stone Age located in the Himalayas that prove that the Tibetan Mastiff’s ancestors have been around for thousands of years! The Tibetan Mastiff’s original purpose was to guard and protect and it's still an exceptional protection against intruders. The breed is impressive in size and is described as a watchful but aloof guardian. With its kind expression, the Tibetan Mastiff also makes a great companion to those it feels loyal to! The Tibetan Mastiff is described as a sensitive breed that is in tune with its emotions and the emotions of others. If there is conflict present, your dog may be able to sense your emotions and become guarded and protective. The Tibetan Mastiff is highly territorial of its family and its home and will protect it. Considered a strong-willed and courageous breed with a lot of intelligence to offer, this enormous canine is often described as being fierce and aloof. The Tibetan Mastiff does well with families but extra precaution must be taken regarding small children to prevent innocent but rough play. Older children are recommended for the Tibetan Mastiff due its nature in wanting to guard. It is wary of strangers and other animals. Early socialization can help curb this behavior but it may not entirely disappear. Due to its protective nature, it is important to be able to train your Tibetan Mastiff with consistency and firmness. Training will involve patience and a kind but consistent hand.